The first time I heard that someone else's Senegal Parrot could crack almonds, I was simply astonished. It just did not seem to me by the look of that beak that a Senegal could take an entire almond shell in its beak and snap it in half like a nut cracker. Likewise I was surprised that my Cape Parrot with quite a suitably sized beak for the job couldn't crack almonds either. Read on to find out how I taught both of my parrots to crack almonds on their own and how my Cape Parrot can even crack open a walnut now. At first though I could give the parrots a nut and they would play a little bit but then eventually discard it. They were not motivated to spend a lot of effort chewing the nut because they were unaware of the fantastic reward inside. This is where I needed to provide some help. I learned that baby parrots do not come with the knowledge required to just break open a nut so some assistance is required on our part. The first step is to introduce the parrot to the food within the shell itself. By letting the parrot play with it, it will quickly realize that it tastes good and want more. The next step is to let the parrot play with the shell. 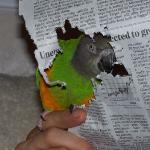 Parrots are destructive and naturally enjoy breaking things so no doubt they will enjoy chewing up the shell itself. Use a nutcracker to break a nut and just give the shell to the parrot to experiment with. Next start introducing the parrot to the concept that there is a tasty nut inside of the shell and it requires breaking open. At first try to break the nut directly in half and let the parrot eat the nut out of the half shell. Once it is has figured this out, you should be able to crack the nut progressively less and less until you no longer need to crack it at all. When introducing your parrot to its first uncracked nut, try to find the smallest one possible and that has some defects pre existent in the shell (such as small chips/cracks). If the parrot can succeed at breaking an easier nut on its own, it will be more motivated to spend long spans of time working on the difficult ones. It turns out that my Senegal Parrot can crack open an almond and my Cape Parrot can even crack open a walnut. I realized that they do it somewhat differently than a nutcracker. Instead the parrots learn to chew open a hole in one side of the nut and then use the tip of their beak to scoop out the nut from inside or chew the hole wider. This is why parrots can still eat a nut that would otherwise seem too large to break with their beak. So go ahead and give it a try and just make sure that the parrot continues being rewarded all along the way. This process probably happens naturally in the wild. Young parrots learn about nuts and difficult to reach foods by watching other parrots eating them. Furthermore the juveniles can find leftovers discarded by older parrots and nibble out what's left from the shells cracked by adults. We can simulate this same process by letting them watch us consume nuts and pre-cracking some for them to try. Loved this video! I have 5 Senegals and 3 African Greys. One Grey and one Senegal crack the nut open into two pieces and after dropping the shell halves, consume the meat of the nut by holding it in their foot while taking small bites. I'm pretty sure that the Grey learned this behavior from the Senegal. When the Grey was a baby, he was located next to the Senegal. He picked up many of that bird's habits, body movement, sounds, etc. I really do think that cracking the nut shell is a learned behavior that the birds pick up from each other, if they have the ability to be around other birds that exhibit this behavior.